It’s Back!!!!! 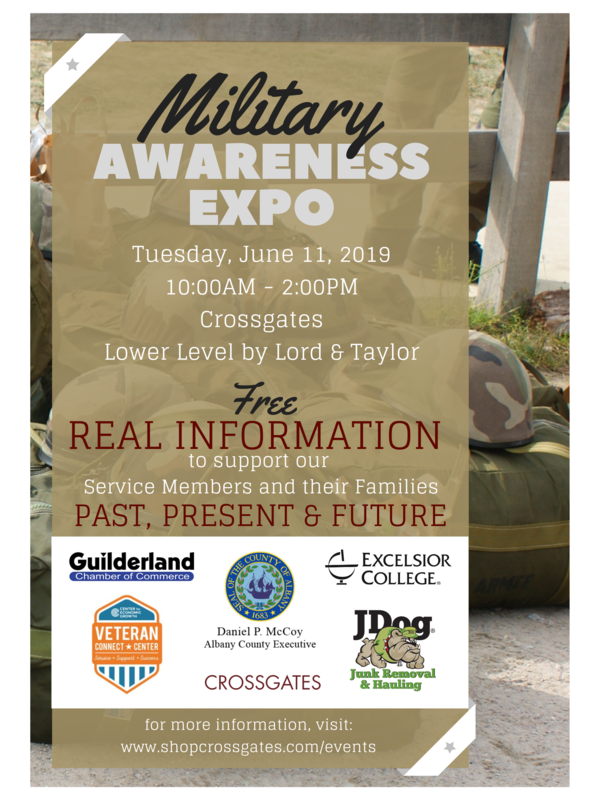 The Guilderland Chamber of Commerce is thrilled to announce the launch of the 2nd Annual MILITARY AWARENESS EXPO at Crossgates. This event will include over 80 vendors in the lower level court area in between Lord & Taylor, Apple and Burlington on Tuesday, June 11 from 10:00 AM – 2:00 PM. We are showcasing supports, resources, organizations, veteran owned businesses, job fair, recruiters and more. All services that connect with our military and their families, PAST, PRESENT and FUTURE. We are partnering again with Albany County Executive Daniel McCoy’s Office and Co-hosting the Honor a Living Veteran Program. Have you served? Well so has your family. Bring them along to explore what is available to them! Thinking of serving? Come explore the different branches and ask questions! Does your organization offer support to our service members and veterans? Do you hire Veterans and their families? …then this FREE event is the event for you! Partnerships are available on a first come, first serve basis. To receive more vendor info, please contact Michelle at [email protected] or 518-456-6611.